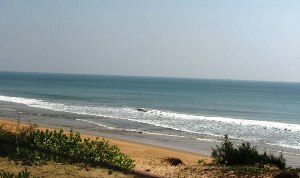 Talasari Beach is a beach in the Balaswar district of Odisha, India. It lies on the north-eastern coast of India. The name Talasari is derived from the two words Tala (meaning Palm) and Sari/Sarani (meaning row). The palm trees surrounding the place gives such a name to it. The word Tala also means rhythm, which is reflected in the sea waves lapping against the shore. The beach is unique as the shore waters are not as turbulent as other beaches and are quite and calm and peaceful. The backwater is also a major attraction to the tourist. people need to cross the back water to reach the sea shore. You can also notice red crabs on the beach At a distance of 88-km from Balasore, 4-km from Chandaneswar and 8-km from Digha (in West Bengal) is the tranquil beach at Talasari. One could behold with surprise the glistening glory of the Bay of Bengal spread like a bejewelled carpet as far as one's eyes could reach. The shimmering surface, the countless Twinkles all around give this calm beach a sole status of its own.